Welcome back to the podcast. Today we have an interview and deep-dive into the world of machine knitting, with Mica Koelhmos. 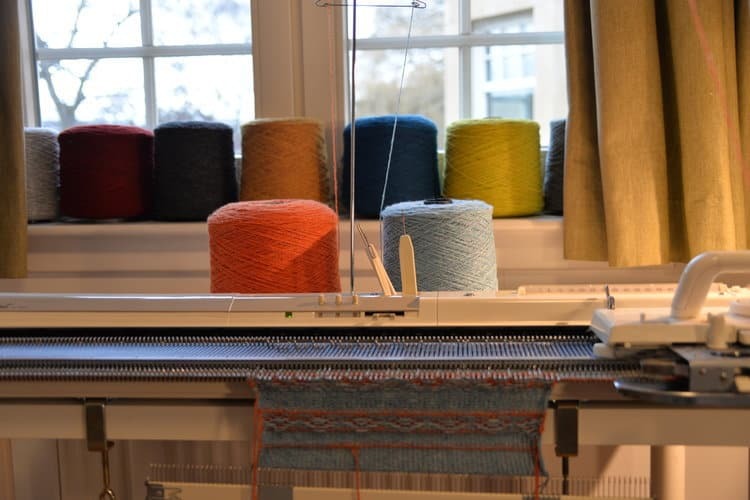 Many of you will know Mica as one half of the duo behind Edinburgh Yarn Festival , but did you also know she is also really lit up about knitting machines and what you can make with them? 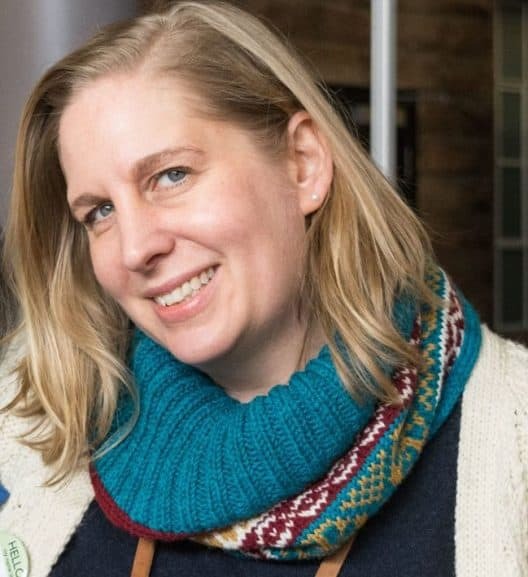 The first I knew about Mica starting to machine knit was when she gave me a lovely dog-tooth Fair Isle cowl that she had made and she told me about her growing collection of machines! Skip forward and last year she attended a summer school at Heriot Watt University. I think that is when my friend became truly enthusiastic about creating fabric and designs on a machine and also wanting more people to know about it! In August I visited Mica with my mic! I hadn’t visited Mica for a wee while and when I came round to record I could see that she has added a machine knitting nook in one half of her living room. Three tables, three machines and and computer hooked up to one of them. To me it look like Bruno Martelli’s amazing three-piano set up, from the Kids from Fame! Mica is a machine knitting maestra! We’d chatted before about doing a piece for the podcast about knitting machines. I grew up with a knitting machine in our house, and my grandparents house. I fell asleep to the rip-rip-rip sound many nights. 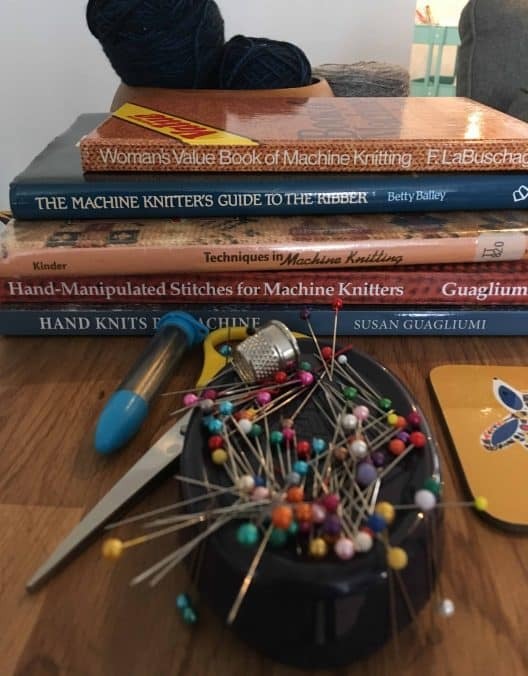 There is another podcast to be made about the history of domestic machine knitting and the harsh realities it could present if you were knitting to supplement your family income (I touch lightly on that in this blog post) but it is also about time to demystify machine knitting for the 21st century too. Mica talks about creating fabric on the machine as the next logical level for her, from her years of hand-knitting. She takes us through her own beginnings with machines and teaches us what she has learned. 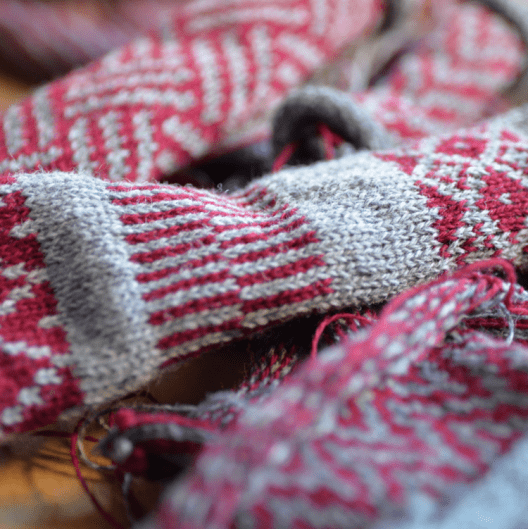 We talk about machine types, we talk about choosing yarn, finding resources and we talk about the fact that machine knitting can occupy a very different headspace, but which can yield results you may never have achieved in handknitting. I’m gonna go out on a limb and say that some listeners today are going to go “Great! Lemme hear all about knitting machines” and some of you will go “huh! I’m not interested at all and/or Machine Knitting doesn’t require skill and/or Machine Knitting is not hand-making! and/or Machine Knitting is CHEATING!” I would ask those listeners to listen anyway, cos I learned so much and I’m sure you will too. You may not want to rush out and buy a machine (you also might!) but this episode is all about demystifying this craft and Mica’s enthusiasm is infectious. 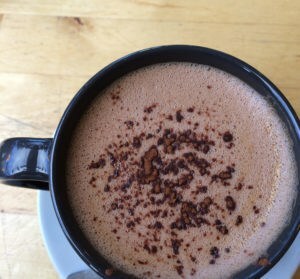 Mica has created an incredible post of info and links to accompany this episode and you will find it at her website Joy of Thread. I just know you will find it helpful and thanks so much to Mica for doing this! This is a longer episode, friends and I will give you a half-way call for a tea-break! 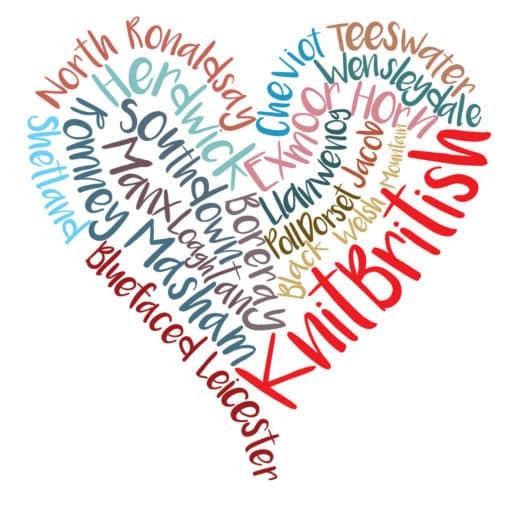 Start to 46 mins – Mica explains why she is so enthusiastic about machine knitting; how she got started; casting on and making fabric; learning how to create items which are knitted flat on the machine; swatch mittens and how accessible machine knitting can be. 47 min – Mica explains her different machines and how they compare; costs and tools & attachments; discussion about the pitfalls of buying a second hand machines; committing to space and set up; the possibilities of effect through stitch manipulation; different head-space from hand-knitting. 1hr,03 – The importance of finishing; how exciting the learning process can be; quick mention of garter and cabling on the machine, Resources and possible difficulties in finding the right resources for your machine (do look at Mica’s notes, above, for links); training and online services and the need for modern resources; Servicing. 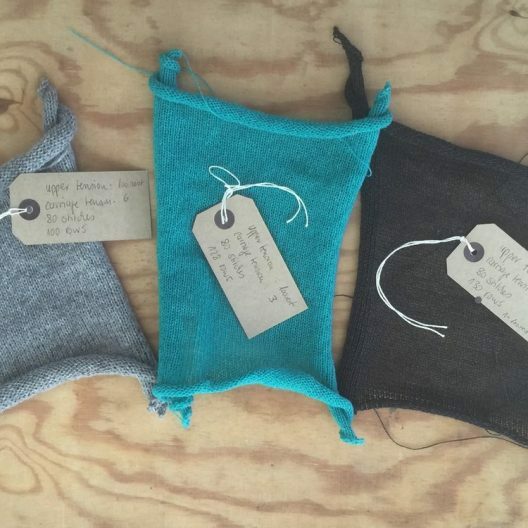 1hr, 17 – Choosing yarn; first projects; Troubleshooting; is machine knitting social? Building confidence and changing our approaches. 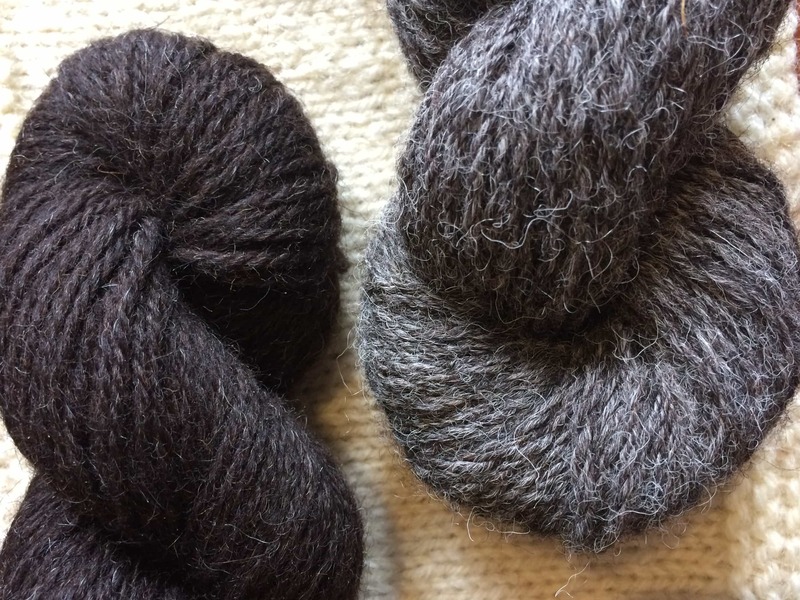 We finish up by talking about what Mica is looking forward to in her machine knitting future. Thanks so much to Mica for being so generous with her time and sharing everything she has learned with us. Do visit her website for details of all links, machines, resources and info mentioned. The podcast is back in December with #WoolExploration with Manx and much more! I really enjoyed listening to you and Mica talk about knitting machines.. I remember having a taster moduale on one when I was at college (1989) and after our tutor helped us set up the machines, loved that immediateness I felt of look I’m creating fabric, and being able to lift up sections of the fabric to create different textures, and to add colour. I mentioned on your episode post on instagram, but just in case someone sees it here as well that if you live in the Norwich area, the Oxfam bookshop on Bedford Street always seems to have a few knitting machine books in there and right now theres no end of them (well over two dozen) in case someone is interested and lives local. This podcast could not have come at a better time for me! I have been in the decicsion making process of purchasing a knitting machine for the past 3 months or so, quite undecided between the standard gauge (SK 280) and the LK 150. I am based in Italy and do not know of anyone that has a machine thus making it even more difficult as I am not able to see one in action or try working one. 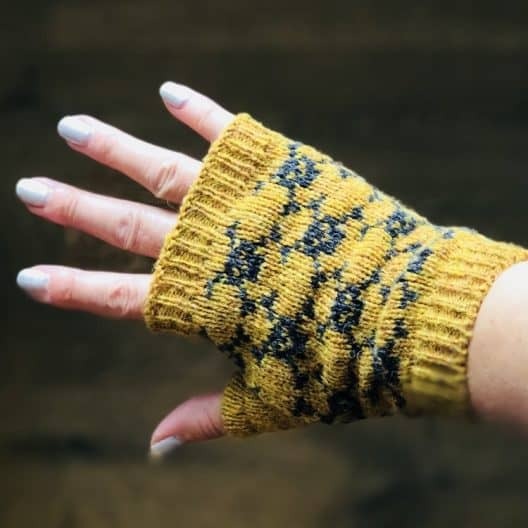 I am an avid hand knitter and would like step up my game a little hoping to make the switch from the current “day job” (which I loathe) to something creative that I have a passion for (even if initally only as a side project). I have a realised that I probably should take a class on sewing up and finishing which I am not at all good at, specially if my goal is to possibly sell my projects. I agree with the comment above left by Ericka Eckles, no one thinks using a sewing machine is cheating, however if one really wanted to everything could be sewn by hand. Also I believe that learning to use a machine is not easy, it requires skill, and at the end of the day the machine does nothing on its own it is fully hand (and brain) operated. Thank you for this insipiring content. Really enjoyed this one! Thank you, Louise and Mica! 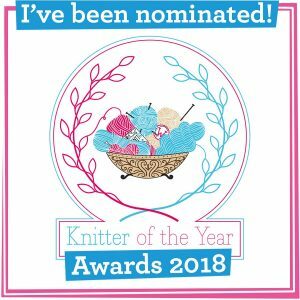 Next PostEpisode 112 – What’s the name of that yarn, Louise?